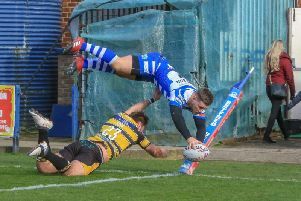 Halifax full back Miles Greenwood was having surgery today (Monday) on the leg injury that ended his involvement in Sunday’s 24-12 loss to Featherstone. Greenwood fractured both his tibia and fibula and is expected to remain in hospital until Thursday. Privately, Fax officials are hopeful that Greenwood, who returned to the club from Batley in the autumn after a three-season absence, will play again in 2015. In-form back James Saltonstall, who played the second half of the game at full back, looks favourite to deputise in Sunday’s home game against Dewsbury (3.0).